Since the introduction of Sharp air purifiers in October 2000, more than 60 million units*1 of products equipped with Sharp’s Plasmacluster technology*2 have been sold around the world. Plasmacluster-equipped products can be said to have created new air for the 21st century. Now, the introduction of Sharp’s S-style Series has brought a sophisticated design to these products. Here, we introduce the challenges Sharp faced in the development of S-style, which has evolved as part of a room’s interior decor with a totally new design. *Plasmacluster and the Plasmacluster logos are registered trademarks of Sharp Corporation. *1Total shipments of products equipped with Plasmacluster technology worldwide, including Plasmacluster ion generators, from October 2000 to the end of July 2015. 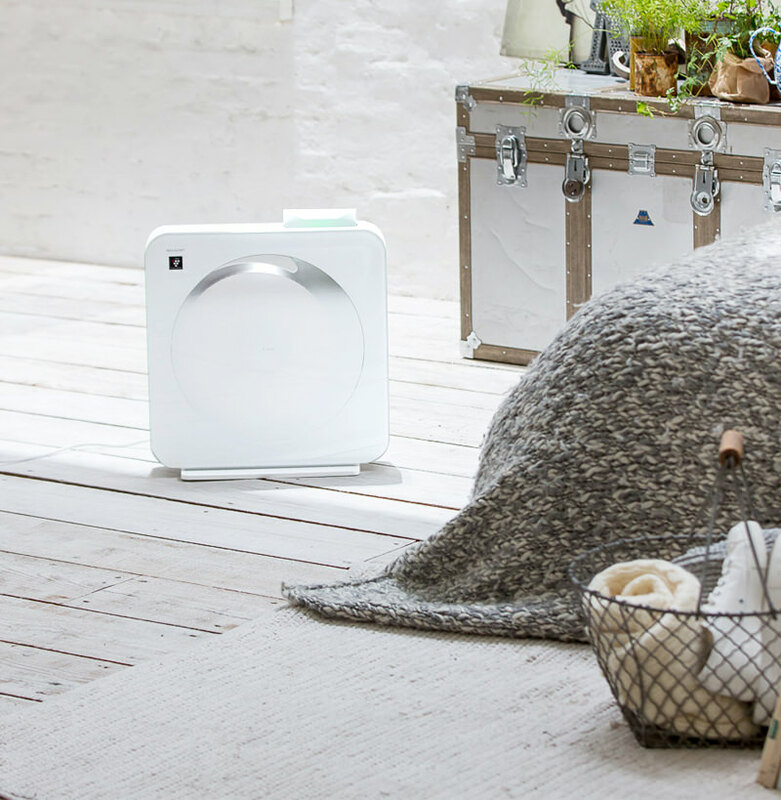 Market research conducted prior to developing new products implied that consumers looked for air purifiers according to not only the product’s functions but also to such factors as design. That was why Sharp decided to develop a high-performance air purifier with a totally new design that would become an integral part of a room’s interior. The key concept was ‘giving shape to high-quality air’. 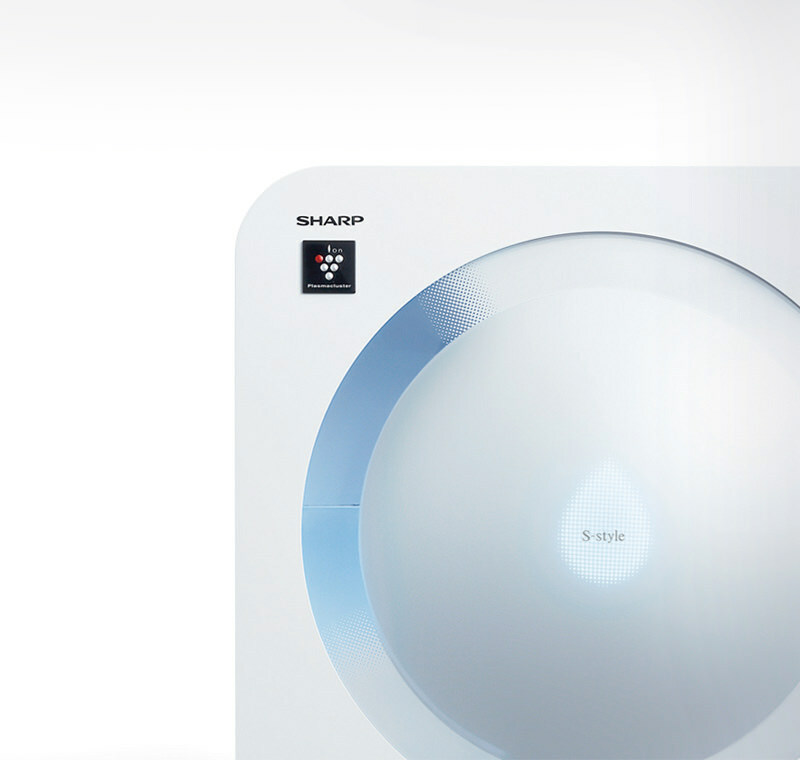 Even though air is invisible, by making the process of air purification and the condition of room air visible, Sharp believed it was possible to give shape to air quality. In addition, the development team proactively made efforts to stimulate such elements as emotions and sensibilities. For example, numerous discussions were held on how the lights should turn on and off, the feel of buttons when pressed, and the texture of materials as seen under a light. Details such as technical feasibility, costs, and the amount of development time needed were carefully discussed from the product planning stage. The development team also pursued a universal shape that would not get in the way when placed in a room and could be used continually without any discomfort. S-style stands for “Simple & Smart.” The mission to create a product with a new style that cannot be produced simply by adding on functions was carried out with relentless efforts of our engineers and designers. The highest priority upon developing the new air purifier was to make it thin and smart in design. Since the fan accounts for most of an air purifier’s depth, the first challenge was to make the fan thinner. The development team examined “nature technology,” which studies wild animals for ideas. Sharp already had a history of adopting nature-inspired technology in products such as air conditioners and fans, enabling to further evolve those products. 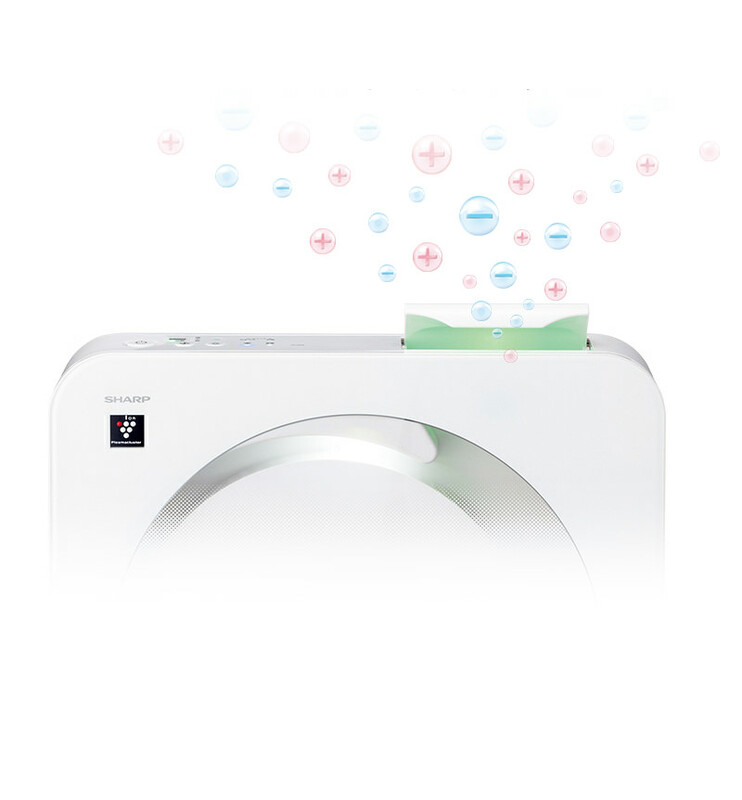 S-style air purifiers employed nature-inspired technology in the fan, referring to the shape of dragonfly wings. The unique shape of their wings allows dragonflies to fly around freely. Countless bumps on the cross-section of their thin wings cause small vortexes to occur when air hits the wings. These vortexes send air rolling smoothly backwards like a wheel, reducing air resistance on the wings and allowing dragonflies to fly quickly and steadily with little effort. By applying dragonfly wing concepts, Sharp has developed a “thin nature fan,” successfully reducing fan depth to 20 mm—one third*3 the conventional depth. As a result, the overall depth of the product was reduced to 98 mm, approximately half*4 that of conventional models. How should ‘giving shape to high-quality air’ be described with our products? Sharp continued its development efforts while constantly considering this question. *3Compared to model FU-E30, which has a fan depth of 60 mm (conventional Sharp product sold in 2014). *4Compared to model FU-E30, which has an overall depth of 180 mm, excluding the legs (conventional Sharp product sold in 2014). Making the fan thinner greatly enhanced the design possibilities. To maximize the attractiveness of this product, the designers took a different approach than usual. First, to embody the concept of the “giving shape to high-quality air,” the development team came up with the idea of exposing the structure of the improved fan and how the fan purifies air. To realize this, even the internal design of the product, which is usually concealed, would have to be beautifully designed. Acrylic board was adopted to create a highly transparent, nearly distortion-free panel for the front of the product. White resin was used for the fan, which is different in color from other parts, to create a beautiful contrast between the main body and the fan, visible from the transparent portion in front. As such, every aspect of product design was thoroughly reviewed. The employment of lights was carefully examined as well. Some mentioned using vivid lighting to make the product stand out at stores, but the development team decided to focus on actual usage in the homes of customers. Adjustments were made to how the lights are used, such as how they are turned on and off: the lights gradually grow brighter during start-up and slowly turn off, as if falling sleep, when the power is cut. By designing the lighting to make the air purifier appear as if it is breathing, the development team strived to create a product that would appeal to the five human senses. 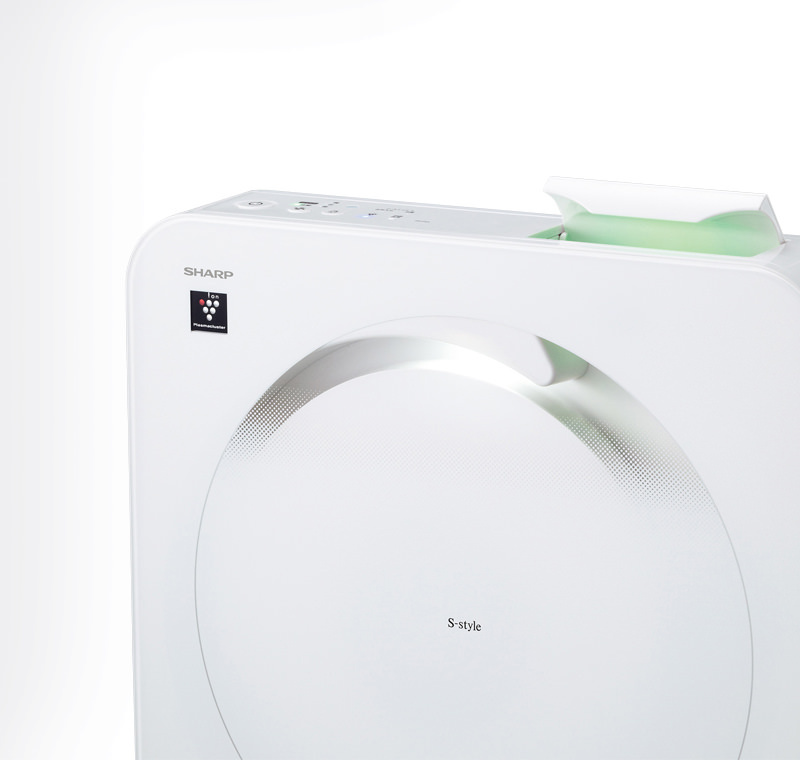 The humidifier introduced at the same time also incorporates a design that embodies the S-style concept. To express a soft form suggesting an image of a water drop, transparent ABS resin was shaped into spheres. By welding two spherical panels with ultrasonic technology creating a double-layered structure, a beautiful three-dimensional sphere was formed for the product cover. Through trial and error under various light environments, the product exterior color was adjusted into a most suitable white with a natural appearance to harmonize in a room’s interior decor. Spherical panels made of highly transparent ABS resin and lighting in seven colors*5 illuminates the water inside the product, adding a decoration to the room. Bubbles from the illuminated water occasionally arise with a popping sound. This gives users a warm feeling, making you want to keep on looking at the product, similar to the feel of gazing an aquarium filled with tropical fish. Preferences regarding such movement, how lights turn on, the colors used, and the sounds produced tends to differ from person to person. This is why the development team patiently and methodically conducted repeated discussions. What motivated such earnest efforts was the strong desire to create a new type of décor-complementing product that appeals to the five human senses and is more than just a mere electronic appliance. *5A total of seven colors are displayed: five colors indicate humidity levels, one color indicates that only the Plasmacluster function is operating, and one color indicates that the water tank is empty. Although the design is an important factor of S-style products, improving functions for air purification was heavily considered as well. To enhance its air purifying effect, the S-style Air Purifier <FP-FX2> was equipped with high-density Plasmacluster 25000*6 —conventionally employed in models intended for larger rooms. The air outlet was also modified, since it is essential to disperse Plasmacluster Ions throughout the room. Numerous prototypes were developed and a louver-shaped air outlet was adopted. As a result of this change, the airflow—which previously could only be directed upward—could also be directed horizontally to both the left and the right. In addition, the product was equipped with a high-sensitivity dust sensor, a PM2.5 monitor, and an electrostatic HEPA, which can collect more than 99.97%*7 of 0.3μm microparticles. The synergistic effects of these high-performance filters with deodorizing function repress airborne viruses*8. This is how “S-style” was created—enhancing the air purifying function while also developing an unprecedented design. *6This figure was determined by placing the product near a wall and operating the product at high airstream while measuring the number of high-density Plasmacluster 25000 Ions in the center of the room at 1.2 m above the surface of the floor. The ion number was measured per 1 cm3. *7Dust removal performance of the filter. This differs from the removal performance for the entire room. *8● Testing organization: Shokukanken Inc. ● Test method: performance evaluation tests were conducted in a test space of about 25 m3 based on the Japan Electrical Manufacturers' Association standard (JEM1467). ● Test target: one type of airborne virus. ■ Test results: removal of 99% in approx. 45 minutes. ● Testing conducted at high airstream using FP-FX2 of the S-style Series. Conventional air purifiers were developed mainly focusing on the improving the functions of air purification by changing the materials and structure of filters, enhancing the sensor to measure more minute dust and particles, and such. In a sense, adding on functions was the path to evolving air purifiers. However, going forward, there will be increasing demand for design elements as part of a room’s interior decor that adapt household appliances to diversifying lifestyles. The introduction of these S-style products comes from the desire to provide a more enriched lifestyle in line with the diverse lifestyles of customers. Sharp will continue to provide new value by creating products that offer the kind of performance and design that customers find attractive.